“I want to know how you are. What does your head say? What do your heart, your hands, and feet say? What do you want to work on? What do you want to do in your life?” These are some of the questions asked by Radiah of ACT Alliance member International Orthodox Christian Charities (IOCC) to participants in their career workshops. Nearly 30 participants gathered at IOCC’s Livelihood Resource Centre in East Amman, Jordan, for a career workshop which is part of a project funded by Diakonie Katastrophenhilfe Austria. The centre serves people of different ages, genders, and degrees of disability. At one table sat Bushra (25), who fled from conflict in Daara, Syria, with her five children; Armi (32) from Jordan, who has used a wheelchair since early childhood; Ahmad (19), who has intellectual disabilities and was accompanied by his mother; and Raidah, who oversees IOCC activities at the centre and has 20 years of experience in humanitarian aid. “When they come see us for the first time they … expect us to give them money, distribute food coupons, or provide them with money for rent,” said Raidah. That is not the aim of this project. “What we offer is hope,” said Raidah. In practice, hope is manifested through vocational training and help with finding a job. The assistance aims to equip people with the skills to create sustainable change in their lives. Before starting the vocational training, Raidah encourages participants to consider the sort of work that they would be interested in. “Where are your talents? What are you good at?” asks Raidah. “When you know that, you can tell me which steps you want to take with your head, heart, hands, and feet to make it happen,” she continued. The questions tend to spark lively conversations. Discussions amongst the participants tend to be emotional, and tears and hearty laughter alternate. Despite the tensions from years of hardship, the will to create a better future for themselves becomes tangible. The centre is located in one of the city’s most impoverished neighbourhoods, which is home to a large number of Syrian refugees. 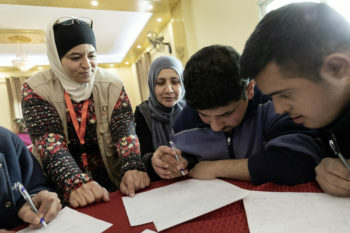 Within a few weeks of its opening, the Livelihood Resource Centre became a focal point in the community, particularly for Syrian families and Jordanian households in need. The centre offers vocational workshops and hosts job fairs for community members, including tailored assistance for women and people with disabilities. Participants explore their talents, practice for job interviews, and encounter everyday work situations to help them to build their skills and confidence through role-playing. “And yes, it works,” Raidah said. “And even if they’ve found a new job, people stay in touch with us or stop by to talk with us. 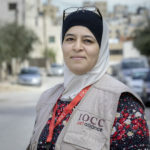 We support them throughout their everyday life.” Over 370 people have participated in the program, and the IOCC team is searching for opportunities for future job fairs. The support provided through Diakonie Katastrophenhilfe Austria and IOCC’s partnership is having an impact—one person and one job at a time. "We want to walk with you"